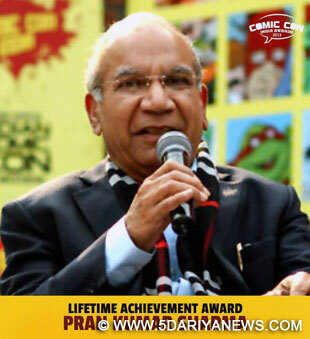 The third annual Comic Con India Awards will honour Pran Kumar Sharma, creator of "Chacha Chaudhary", with the Lifetime Achievement Award on Feb 9.The award is an attempt to bring into focus the novelty of this art form and acknowledge the efforts of numerous writers, artists and publishers in the field.The awards ceremony will take place on the last day of the 4th Annual Indian Comics Convention, starting Feb 7 at the Thyagaraj Stadium here. "At CCI Awards we honour and felicitate the best Indian comics and comics creators, and give them the recognition they deserve amongst their peers. We have competitive categories along with a special Lifetime Achievement Award given by Comic Con India every year," Jatin Varma, founder, Comic Con India, said in a statement.Comic Con India is also honouring Tinkle Magazine with a special award for its over 30 years of contribution to Indian comics and graphic arts. The other categories include best graphic novel, best colourist and best cover.